Bored with your regular workout? Here is our list of the weird, the wacky, and the wild in fitness – the things that make you turn your head when you see them at the gym or on the track. But is being weird reason enough to try them out? Maybe not, but some of these could actually be an entertaining change from your old fitness regime. Before you join in, find out what these weird trends are all about—and whether there’s any science to back up their flashy oddness. It may seem like a kid’s toy more than exercise equipment, but this exercise, which uses special boots with an arched spring on the sole, is growing in popularity. 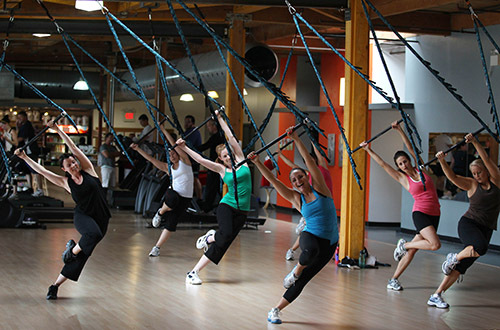 Kangoo jumps are one of the most efficient ways to burn calories. It increases your endurance level and tones muscles while reducing impact on your joints. You can run with them as well as use them for aerobic-like routines in the gym, and you’ll have a blast doing it. Zuu Fitness, (yes, like Zoo), is a fitness routine designed in Australia, which trains you to imitate animal movements in an interval-training fashion. The basic movements used are pushing, pulling, bending, twisting, squatting, and lunging, all while mocking animals like gorillas, frogs, and bears. While it may feel unnatural and silly, the “primal movements” are some of the most natural movements of the human body. Because they are so natural to how our bodies were built, Zuu fitness helps to achieve a full-body workout with a few simple moves. Women who take pole-dancing classes say it helps them build confidence and makes them feel empowered and love their bodies. High intensity pole exercises are a combination of isometric workouts and strength-based training which promote weight loss and build long, lean muscles. In one class at a beginner to intermediate level, you are expected to burn at least 250 calories, and you will be feeling great about yourself and about what your body can do when you are done. Have you ever watched circus acts and watched the acrobats wow you with their grace, but also by their balance and strength? Circus workouts include trapeze, silks, and aerial arts, are effective in building lean, functional muscles, and working out multiple muscle groups at once. Training might be challenging, but it will also be fun and you will be surprised as to what your body can do. Or not. Safety net recommended. High Heel Workout trainers swear you’ll get a tighter behind, slimmer thighs and narrower hips. You do squats and lunges, while wearing sky-high heels to feel your muscles work hard. Doing classic exercises with high-heels allow you to work out muscles you don’t normally use doing those same moves with sports shoes. It might seem dangerous to you, and generally sounds like the most stupid workout idea of these 12, but if you love your Jimmy Choos, give it a try. 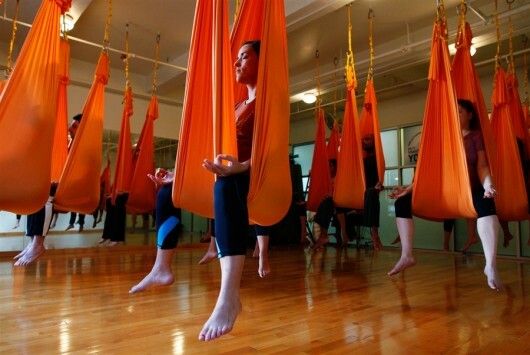 Anti-Gravity Yoga is yoga mixed with silk suspension. You do some classic yoga poses but with the aide of the silk suspension to reduce impact on your joints. A mix between yoga and capoeira, this fitness routine also includes elements of modern dance. The goal is to improve your agility and balance while doing cardio as well. You burn up to 800 calories per hour. These moves, all performed outside of a gym, are bodyweight training. 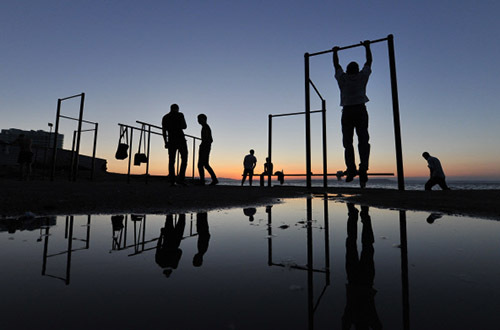 You use playgrounds, parks and yards as your gym and take advantage of benches, monkey bars and open areas for all types of workouts. 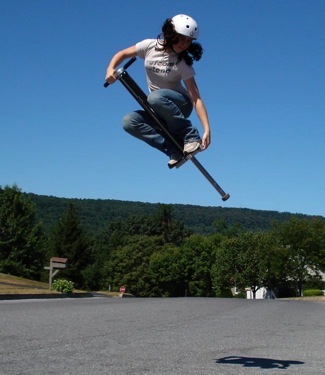 The Pogo stick has been reborn in order to give you a great workout. It is low-impact on your joints. The polymetric exercises build the ability to rebound and jump. This dance-based workout invites participants to flex their head and take control of the body. If you wanted to look weirder than when doing Zumba, this may be for you. Yoga bells combine kettlebell training with Hatha Yoda – an unlikely bunch but very effective for weight loss and toning. They aid in providing flexibility and strength to you while giving the women an sense of order and regularity, while trying something out of the box. Sandbells are just as functional as regular dumbbells, but these solid static-free weights shift slightly depending on your grip and muscle focus which makes for a more complete workout. You can even use Sandbells with CrossFit.